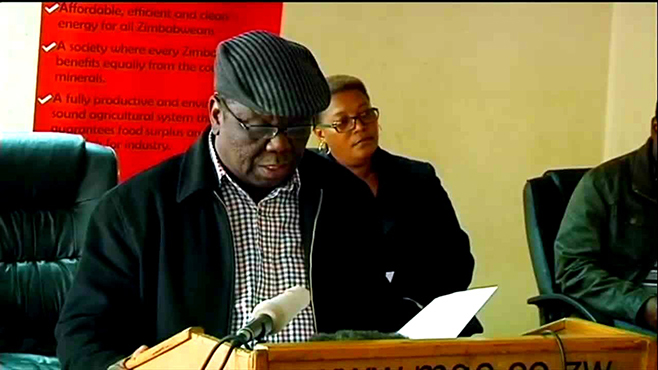 ZIMBABWE – Gweru — An audit report compiled by a tribunal set up by the former minister of local government, Ignatius Chombo, has unearthed widespread graft at council, with Movement for Democratic Change (MDC-T) leader Morgan Tsvangirai having been sucked into one case of unauthorised expenditures. Tsvangirai, whose councillors control the local authority, is said to have blown US$1 875 when he was hosted by suspended Gweru mayor, Hamutendi Kombayi during his tour of council projects early this year. Kombayi has been ordered to pay back the amount splurged on his boss. The tribunal, set up to probe allegations that councillors were pocketing huge amounts in allowances and salaries, has unearthed major anomalies. The audit, seen by the Financial Gazette, revealed that council operated 19 bank accounts mainly for employee salaries, most of which had overdrafts. The audit report rapped Gweru town clerk, Daniel Matawu, for being reckless and negligent. “The town clerk should safeguard public funds and ensure that they are spent only on legally authorised purposes in terms of the Constitution. The town clerk failed to take effective and appropriate steps to prevent irregular, fruitless and wasteful expenditure as required by law,” reads the report. The audit report revealed instances in which councillors would, for example, attend workshops on how to operate a computer, blowing a total of US$99 573 on food and other expenses at the city’s Fairmile Hotel in the process. Kombayi and 15 others were suspended by Local Government, Public Works and National Housing Minister, Saviour Kasukuwere, in August although the High Court nullified the suspension. The report indicated that US$31 544 was spent on laptops and training councillors to use the gadgets, while US$313 419 was reportedly splurged on vehicles for middle managers. “The provision of these computer gadgets and the computer literacy training programme was not part of the council’s conditions of service,” the audit said. The audit also revealed that council spent US$155 812 on travel and subsistence allowances in the past year as councillors attended various workshops not relevant to their portfolios. “Council paid US$155 812 for travelling and subsistence allowances to its councillors who undertook training workshops not relevant to their duties and which were of managerial nature. For example, the mayor attended the accountants conference and councillors attended fraud investigation workshops,” it said. “The current travelling and subsistence standard and special rates of US$278 and US$470 respectively per day for unapproved allowances is, in audit opinion, unsustainable thereby causing the council to experience budget constraints,” the report added. Since 2013, when councillors assumed office, unnecessary expenditures seem to have been the order of the day, as the audit also shows that councillors were given US$600 each to go and watch a boxing match in Chiredzi. Councillors have since been ordered to pay back US$50 667 on travel and subsistence allowances they received from 2013 to date. Gweru councillors purportedly bought residential stands at 60 percent less than the full cost against a ministerial directive that council should sell them at full market value. Councillors are also said to have purchased protective clothing worth US$770 despite having received a donation of similar items from the German Institute of Zimbabwe. Ironically, council employees never received the clothing. Officials from the local authority also allegedly made a deal with Bata Shoe Company to provide protective clothing in order to offset the company’s water and rates bill, a move that drew the ire of employees who had gone for months without pay. Gweru also incurred US$308 181 92 in litigation costs when it contracted a private law firm to resolve a dispute between the local authority and its former chamber secretary, Richard Masinire. The law firm was paid US$40 000. The audit report revealed that the city’s survey technician attended a five-year study programme at the Midlands State University from 2010 to 2015 while on full salary without council approval. Some of the council managers with leave day accruals of 120 days were said to be cashing their excess leave days at a time employees were wallowing in poverty. Poor council decisions have also cost the city; for instance, some of the local authority’s employees at its beer brewing plant, Go Beer, were fired on three months’ notice in July, but successfully contested their dismissal and had 345 council beasts auctioned as compensation. The cattle were sold for US$212 170 to offset a US$189 255 88 compensation claim.